Perfect for narrow lots, this home packs charm in every corner. Features abound in this two-story home beginning with the great room. With a loft above and two-story ceiling and fireplace, this entertaining space makes a grand welcome into the home. Columns punctuate the entrance into the dining room and a nearby wet bar saves steps to and from the kitchen. For less formal rooms the breakfast room with adjacent patio is the perfect spot for snacking and conversation. Flowing easily into the kitchen, this open area keeps mealtimes relaxed. The second level is overflowing with functional details. A railing provides views to the great room below, while the upstairs utility room enables family members to do laundry close to their bedrooms. The master suite is truly luxurious. With a tray ceiling, walk-in closets, skylights and twin vanities, this room deserves its namesake. 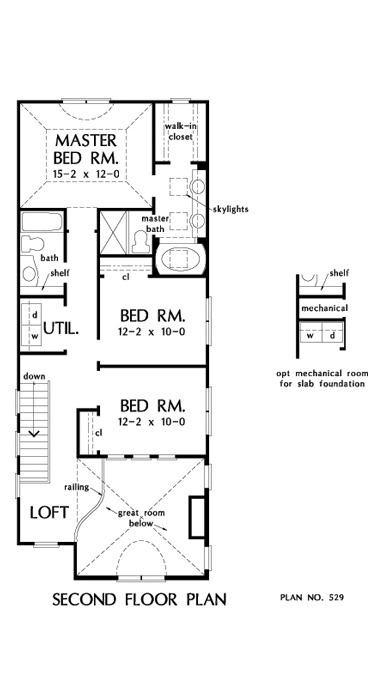 1st Floor: 751 Sq. 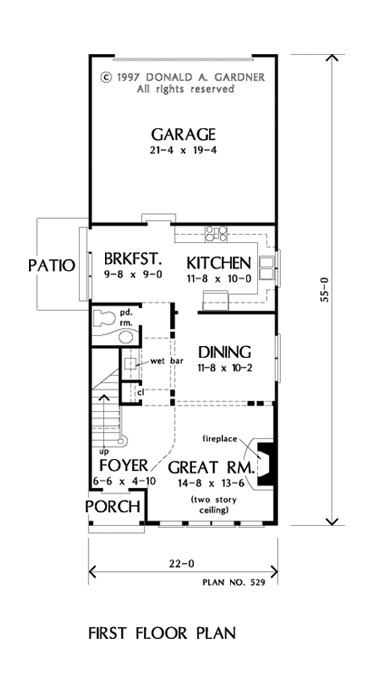 Ft.
House Dimensions: 22' 0" x 55' 0"
Great Room: 14' 8" x 13' 6"
Master Bedroom: 15' 2" x 12' 0"
Foyer : 6' 6" x 4' 10" x 9' 0"
Dining Room : 11' 8" x 10' 2" x 9' 0"
Great Room (2 Story): 14' 8" x 13' 6" x 26' 10"
Breakfast Room : 9' 8" x 9' 0" x 9' 0"
Utility Room : 5' 0" x 3' 0" x 9' 0"
Garage : 21' 4" x 19' 4" x 0' 0"
Master Bedroom (Tray): 15' 2" x 12' 0" x 13' 0"
Bedroom #2 : 12' 2" x 10' 0" x 9' 0"
Bedroom #3 : 12' 2" x 10' 0" x 9' 0"
Porch - Front : 6' 6" x 4' 0" x 0' 0"
Deck / Patio : 6' 0" x 10' 8" x 0' 0"
Loft / Study : 7' 0" x 7' 4" x 9' 0"
Other : 5' 0" x 2' 4" x 9' 0"